To operate reliably und act quickly in case of problem it is important to be aware of the current topology of the plant. PROscan Active by Indu-Sol scans the PROFINET network automatically, in variable time periods and during operation and creates a graphical live topology plan. This includes information about PROFINET name, IP or MAC address, current port allocation, line lengths, damping reserves and notice of breaks. Additionally, the software provides a clear list of participant information including hardware and software version, device name and type. 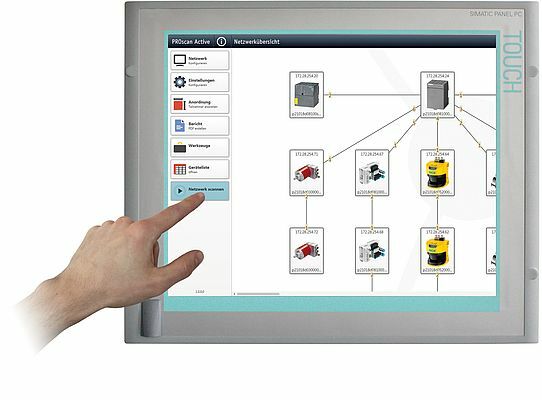 The software is touch panel optimised and works independently of manufacturers. Only one requirement: The PROFINET or TCPIP device has to support the LLDP standard. A user friendly price policy provides to install the software minimum one time per machine on the according visualisation computer. Who Accessed the Network When, Where and Why?